Ever wanted to play the popular Game Show game Who Wants To Be A Millionaire? 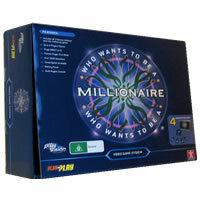 Check out this board game version of Who Wants To Be A Millionaire. Other than the TV cameras, Regis Philbin, and the real money, this is the same game including easy laughable $100 questions, life lines, and a over 2,000 questions. Now you can prove to all your friends and family that you really would have won a million dollars. Play Who Wants To Be A Millionaire or act as Regis Philbin. A great family game to pass the time. To be the first player to win a million dollars or be the richest player in the game after an agreed number of rounds. The number of rounds is decided at the beginning of play. 5 question and answer card consoles, 1000 cards, money, 15 lifeline tokens and the official Who Wants To Be A Millionaire rules and instructions. Please keep in mind that the official Who wants to be Millionaire party rules and instructions could be different depending on the game version you have. The rules below are some of the exact directions on how to play Who wants to be Millionaire. Share with us your comments, funny stories, tips, advice, strategies, creative ways to play, questions about how to play, problems with the rules or anything you want about Who wants to be Millionaire. All submissions will be reviewed within 24 hours. Click here to add your Who Wants To Be A Millionaire comments. We played this for the first time and so many of the answers were incorrect. For example: if food is served “ en croute” what is it wrapped in, the answer said Vine Leaves which is wrong. The correct answer is Pastry! Where can I find the instructions, can you give me a copy. Hi We bought the game who wants to be a millionaire and we don't have the answers. We purchased a Pressman Who Wants to be a Millionaire board game and there were no rules in the game. Can someone send me a copy of the rules. Thanks.